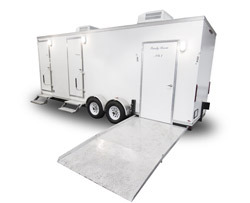 The Comfort Restroom Trailer series is perfect for those outdoor celebrations where typical restroom facilities are unavailable but needed. Standard equipped with climate controlled interiors, running water sinks and flushing toilets. 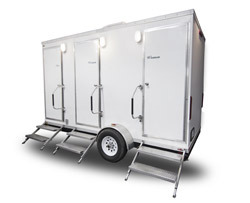 This 2-stall restroom trailer is perfect for outdoor events that require a facility for both men and women. 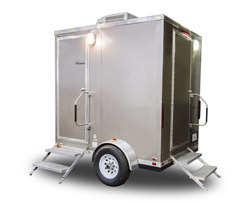 This uniquely-styled 3 stall trailer adds an additional stall and all the amenities your guests have come to love. Equipped with a hydraulic lowering system, the 5-Stall ADA is perfect those who need special accommodations. 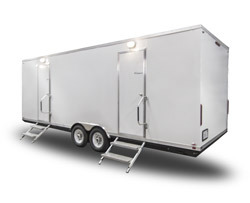 The largest of this series, the 8-Stall is perfect for larger outdoor events that desire luxury and functionality.